In this blog post I will share with you a case report on a cold, unknown, reality, and lead you into the deep abyss of multi ligament traumatic knee injuries paired with peroneal nerve damage. Most importantly, I hope my experience with the story of a young college football player and his road to recovery, along with the story of others who have miraculously returned to playing football after sustaining devastating knee injuries with nerve involvement will inspire you. He was being recruited by top division 1 institutions while playing cornerback at junior college with the dream of playing at the next level. Running a very fast 40 yard dash time in the low 4 second range, he was a top prospect until one spring inter-squad practice. On that day, he went to make a tackle, caught his cleat in the ground pivoting, and suffered a non-contact, left anterior knee dislocation. 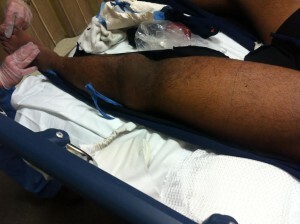 He was rushed to the ER where his knee was reduced 45 minutes after the injury. After undergoing imaging and physical examinations, including vascular studies, no arterial damage was found, and he was in stable condition. He was diagnosed with a complete ACL tear, PLC injury, a partially torn MCL, a partially torn PCL, and meniscus tear. A few weeks later he began to experience neurological symptoms of left foot drop, and underwent EMG with the diagnosis of peroneal nerve palsy. He was put in an AFO and was treated conservatively with pre-operative rehab. After experiencing insurance issues, and having trouble accessing care, he finally underwent ACL-R, PLC-R with allograft, and peroneal nerve neurolysis a bit over one and a half years after his injury. Surgeons use allograft in a traumatic multi-ligament knee injury because a lot of graft tissue (especially for the posterolateral corner) is needed. It is also used to avoid creating the creation of more induced knee trauma with a patellar tendon autograft, as a multi ligament knee injury can significantly affect patellofemoral biomechanics. We began post-op PT a bit over 1 month after surgery where he presented with good ROM, +1 joint effusion, and severe atrophy t/o his entire involved LE. In addition he had trace left ankle dorsiflexion, 2/5 eversion, 3/5 inversion, and 4/5 plantar-flexion. His post-operative Physical Therapy prescription included ACL-R, PLC-R, peroneal nerve neurolysis, WBAT, wean off crutches and brace, evaluate and treat, without any specific precautions given. Physical Rehabilitation of the Injured Athlete by James R. Andrews, Gary L. Harrelson, and Kevin E. Wilk. The first few weeks of treatment included mostly gait training, straight leg raises (except for sidelying abduction), NMES russian e-stim for quad re-education, AAROM, short crank bike, hamstring and calf stretching (supine), PROM DF, ankle theraband exercises, patellar mobs, and ice. Due to the posterolateral corner reconstruction, varus loading of the knee was avoided early on, such as with the load placed on the knee during a normal sidelying hip abduction exercise with an ankle weight. In addition, calf board stretching on an incline board was also held initially to avoid a loaded hyper-extended position of the knee. We progressed over the first month to using a short crank to regular upright bike, weight bearing exercise including leg press, bilateral balance on unstable surface (biodex balance system) full weight bearing calf raises, and retrograde treadmill walking on an incline. At this point in his rehab, he was able to wean down from two crutches to one crutch. He eventually progressed to walking without any assistive device, unlocking and discharging the post-operative hinged bledsoe knee extension brace. During the next phase (around two and a half months post op), we began to introduce more unilateral loading activities, including forward step ups on a 6 inch step, single leg stand cone taps, and discharged leg raises into his HEP. From general observation during exercise along with patient reports, the AFO can be somewhat limiting with certain exercises, such as the leg press, squats, and calf stretching on a calf board. The patient reported that it was difficult for him to feel the surface underneath his foot during leg press and squats. For this reason, once the patient was able to ambulate with good balance without the AFO, all therex was performed without the AFO. During the next phase 12-14 weeks s/p surgery, we prescribed FWB squats after initially performing ball squats to ensure that there was no pain or lack of stability. Eccentric leg press progressed into an 8 inch forward step up and started to incorporate more dynamic loading exercises, including lateral walks with band above knees (with hip clocks at each end of a set), balance board in the medial/lateral direction while tossing/catching a football, and single leg balancing on a foam pad. Lateral walks with a yellow bands around his feet were also added in order to strengthen his peroneal muscles. Quad isometrics were also performed on a knee extension machine from 90 to 60 degrees of flexion to begin very light open chain knee extension. At this point, he was able to ambulate with less of a high steppage gait/foot slap pattern without wearing his carbon fiber AFO. In addition, he had increased ankle dorsiflexion, especially in a gravity eliminated side-lying position. Currently this patient is progressing very well and has meet important milestones including, the ability to ascend an 8 inch step with good control, ROM past 130 degrees of flexion, and minimized gait deficits. We hope to progress toward performing a KT1000 ligament laxity test and biodex strength test by the next month. Interesting phenomenon: When applying russian e-stim to his tibialis anterior, after reaching around an intensity level of 50, his foot began to involuntarily go into inversion. Although the tibialis anterior is also an inverter, it is not fully apparent as to why this pattern was elicited without any dorsiflexion. As we are taught in electrical modalities 101 in Physical Therapy school, direct current rather than alternating current should be applied for a deinnervated muscle; however, we did not have a machine to deliver adequate direct current with enough amplitude to elicit a motor response. There are a few NFL players who are currently in the process of coming back from similar devastating knee injuries, including Dan Mason and Sean Spence. There is certainly a lack of optimism amongst orthopedic surgeons treating these injuries as to the prognosis of returning to play, but perhaps both, advances in surgical techniques and stellar rehab, have shifted the tide. Of course, above all, like with the case I presented to you today, we aim to return even our most athletic patients to normal daily function before anything else. However, we must still give even the most devastating knee injury a fighting chance to a miraculous comeback story. As sports physical therapists, we must aim high, but also not forget that above all else, our athlete is a person who walks, goes up and down stairs, and sleeps, perhaps with a dream that separates the elite athlete from the recreational weekend competitor. A dream to play again.